Start signing now! You can sign "MILK" to your newborn when it's time to nurse or time for a bottle. Sign "SLEEP" at nap and bed times. During mealtime, ask your child if they want "MORE" in-between each spoonful. This will help integrate signs into your daily routine. Will learning signs delay my child's speech? Parents are excited when their child can way "goodbye", but wouldn't worry that they are not going to say it. The ability to sign "BYE-BYE" will not discourage a child from speaking the words. In fact many babies say "bye-bye" shortly after they learn to wave. Similarly, the signs your child forms first may turn out to be some of her first words. 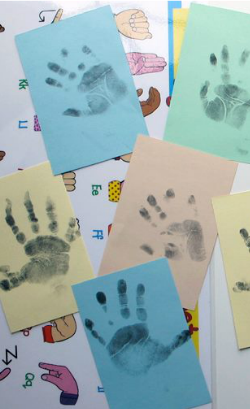 More Baby Signing Myths BUSTED here! My child is already talking. Is it too late to start? It is never too late to start signing with your child! Young children's speech is not always clear. By introducing American Sign Language vocabulary, you are giving them yet another way to communicate. This will reduce frustration for both of you! Learning signs has has many developmental benefits including increased confidence, social skills, enhanced parent-child bonding and an increased vocabulary.